If you've waited in any airport or doctor's office lately, chances are you've observed at least one person knitting away patiently. The knitting craze of recent years shows no signs of stopping. Once you get past the beginners stage, the challenge of figuring out those new stitches can be daunting; not because the stitches are difficult, but because the directions often read like a manual on rocket science. Take heart, a special education teacher is here to break the steps down for you. In the field, it's called a task analysis. The most commonly used yarn over occurs on the knit side of your project. 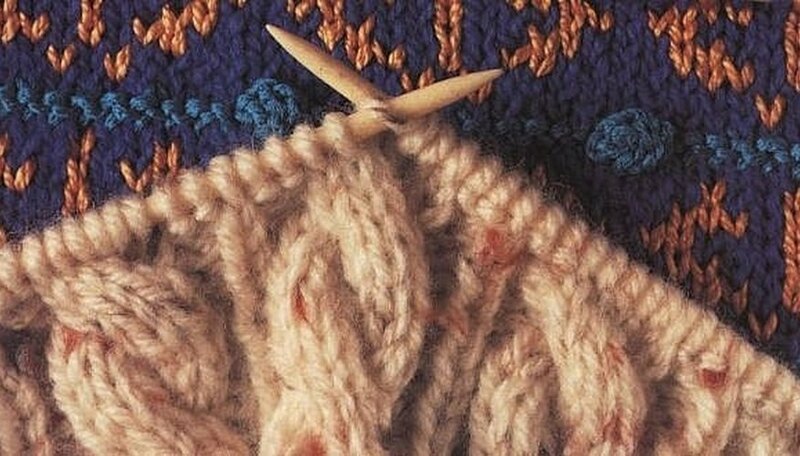 When knitting, the yarn is always held at the back of the needles, but for the yarn forward, the yarn will be brought to the front as if you are purling. The abbreviation for Yarn is yf or yfwd. See illustration. Now, let's do something with this yf. Let's make an increase in our row. Insert right needle in left needle to knit. Take yarn that was brought forward, wrap it over the top and under right needle. See illustration. Next, pull the wrapped over yarn through the loop on left needle. You have just made an increase. My favorite "How to" knitting book is Reader's Digest, Knitter's Handbook. The illustrations are great, and it shows every knitting technique you'll need. It's a must for your knitting library. I've bought two of these books. The dog ate the first one. Let's recap: yf Bring yarn to the front of your work as if to purl. Insert right needle in left needle to knit. 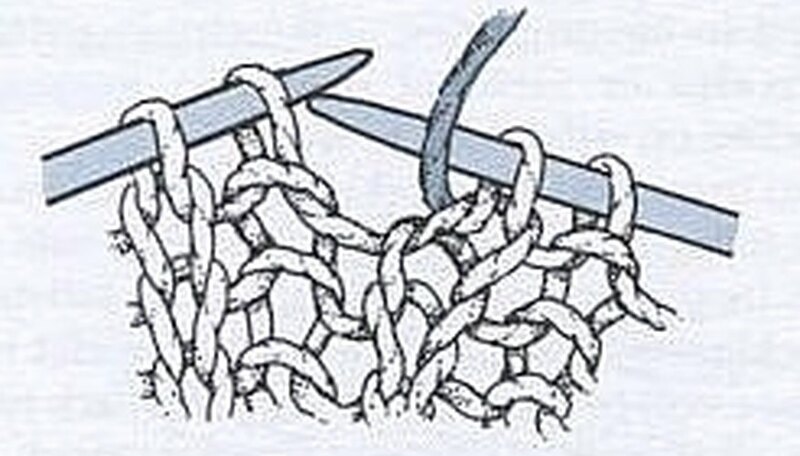 Wrap yf over and under right needle. Pull the wrapped over yarn through the loop on left needle. You've made an increase. 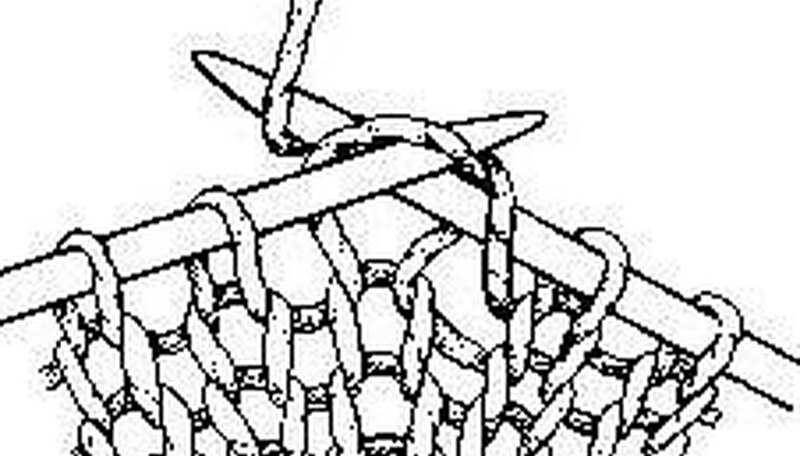 As you can see, there isn't an illustration showing the yarn being pulled through the loop. This is what drives me crazy about how to knitting instructions. Most people needle the visual of every step.